The total site of Denny Wood extends to 23 ha, with this project creating 2.5 acres of new, reforested land. 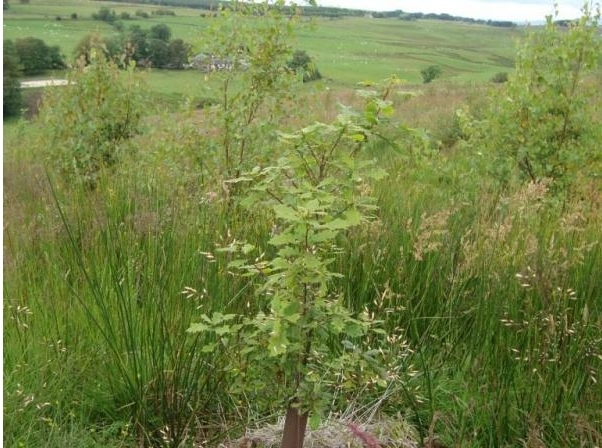 The principle objective of the scheme is to deliver the Central Scotland Forest Strategy of increasing woodland cover within the Central Scotland belt. Additional objectives are mitigation against climate change, biodiversity and landscape improvements and facilitating an educational program. There are some minor watercourses running through the site and the River Carron skirts the north western edge of the site. Best practice was followed to ensure that these features were treated sensitively. CSFT is currently working on a program of educational work with the nearby Denny High School. The site will provide the location and facilities for this outdoor educational work, with part of this including tree planting events. The site has been provided with access points for the educational work, plus noticeboards and pathways for community information and use.